The frontal sinuses are located over the forehead, above the eyes on both sides. The maxillary sinuses are located over the cheek area, in the bone known as the maxilla located under the eyes on both sides of the face. The ethmoid sinuses are located in the bone that divides the eyes and nose. The sphenoid sinuses are located in the sphenoid bone at the center of the skull, behind the eyes. 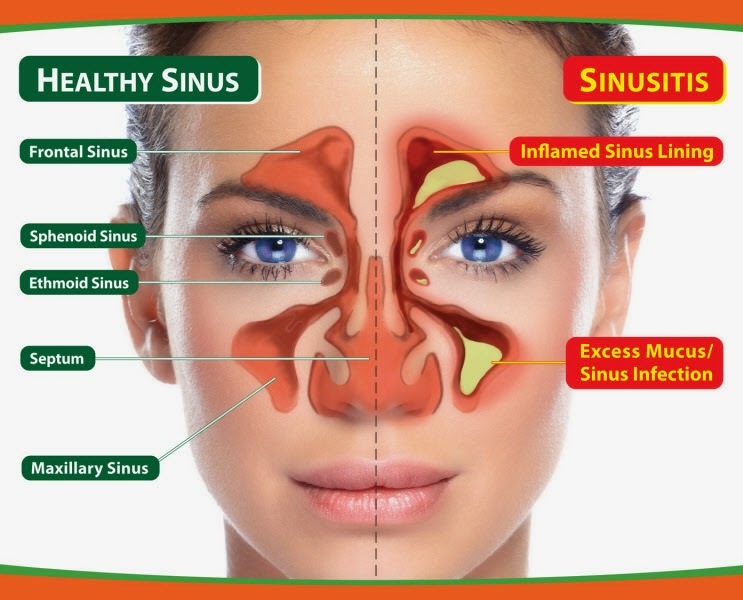 The sinuses are lined by mucous membranes that secrete fluid and are connected to the nasal cavity by small channels or ducts. The sinuses are sometimes collectively referred to as the Para nasal sinuses because of their proximity to the nose. Inflammation due to any cause (most likely due to irritation or infection) can cause a build-up of fluid and increased pressure within the sinuses, giving rise to the typical symptoms of a sinus headache. Inflammation of the tissues lining the sinuses is the primary cause of sinus headache. The inflamed tissues swell and produce secretions that clog the normal drainage system of the sinuses, causing a build-up of fluid and secretions. The pressure of this fluid build-up causes the pain of sinus headache. Inflammation of the sinuses is known as sinusitis. The inflammation may arise due to an infection, an allergic reaction such as hay fever, or to irritation. Most commonly, infectious sinusitis (sinus infection) is due to a viral infection, but bacterial and fungal infections of the sinuses can also occur. Since the maxillary sinuses are located in the cheekbone, infections of the upper teeth can spread into these sinuses. In very rare cases, benign or malignant tumours can invade and block drainage in the sinuses and lead to a sinus headache. The pain of a sinus headache is often felt over the affected area(s) and has been described as a sensation of uncomfortable pressure. There may be tenderness when the area is touched. The pain can worsen upon changing head positions or arising from bed. Nasal discharge may accompany inflammatory processes in the sinuses. The drainage may be clear or may be greenish-yellow in colour. Greenish-yellow discharge usually signals that an infection is present. Swollen lymph nodes in the neck can accompany a sinus infection. Pain in the jaw or upper teeth may be felt in cases of inflammation of the maxillary (cheekbone) sinuses. Homeopathy Treatment involves to increase the immunity. Homeopathy medicines helps to prevent recurrent sinus infection-recurrent sinusitis.